After my disappointment over last night’s denouement featuring “the one from beyond” The Beyonder. It’s beyond me as to why this chump is getting any page-time, especially the goofiness that he tends to bring to a mere scene or two. Only two more issues in the Secret Wars II stack to go! That being said, this mid-80s iteration of Avengers is a bit wonky. There’re only a half-dozen panels with Captain America in them, and I’m not sure who most of the members are. 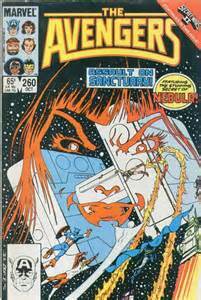 There are a few notables here, however: Quasar is said to helm her (?) new movie soon, Thanos will be a major villain in an Avengers movie, and Nebula was a high-profile addition to Guardians of the Galaxy. Anyhow, Nebula has commandeered a starship named Sanctuary II and wreaking havoc across the galaxy. Firelord has been helping the Avengers, but he calls it quits once he learns they’re working with the Skrulls. The Beyonder shows up towards the end like normal, strutting around in his white pantsuit, looking to “help” the Avengers. That help includes donning some goofy looking garb. Definitely a slap in the face to the rest of “normal” superhero community’s fashion sense. I agree it’s just one issue out of many, but these team books have a lot going on in them. Too much to keep track of. The Beyonder didn’t really ruin this issue, but it’s my duty to blame him anyhow.